MB SD connect C4 with laptop v2018.5 Version avaiable now ,It is ready to work after you get it ,worth to buy. Star diagnosis SD C4 can used by wire connection or lan cable,everything set well before send it out .full chip .detail info. 6. Support Offline and Online Programming. as we know ,it support wifi work,how to set it in WIFI condition ? so can use it directly when you get it .it’s worth to buy and save more time .Best feedback from here . For further info.please use our online service www.autonumen.com or skype if you have . Many times ago, i saw a blog about MB sd connect C4 for benz, the author said he like this tool very much, and make a comparison with mb star c3 for a result that MB Star C4 is much better than c3, I was not too much attention to it. However, a month ago, i also saw a thread on an auto fourm about obd2 tools, the generl mean about the thread is Mb Star C3 is better C4. i think it’s a question, so i want to serach some infos on the internet. I serach “what’s the difference between MB Star C3 and MB Star C4″ with google, and get some answer. Here i made a discription about C3 C4 and with a share. Many people on the internet all said the MB Star C3, C4 software is the same, C4 whit SD CONNECT also with this software, and for the hardware, C3,C4 is same function in diagnosing. For mercedes Benz, C3 and C4 also can do work, in my opnion, MB Star C4 work with all the benz and more than C3, but C3 can do benz truck very well, this is advantage for c3. C4 is much stronger in anti-interrupting ability, when C4 tests cars, it’s hard to influence by the environmenr outside, such as magnetic field，noise. Mercedes Star Diagnostic C4 is much smaller in the appearance than C3. Benz compact 4 SD-Connect is a latest Benz wireless multiplexer. It will connect to the PC by wireless connection. The biggest difference, i think, is connection wiring mode, C3 need 232 port, but C4 can be used with network port, even wireless. Also, the price C3 and C4 is very different, now C3 from autonumen.com is the half price fo C4 as far as I know. could you some guys add more infos? i want to know more, thanks. MB SD Connect C4 with wifi diagnose function. SD Connect C4 multiplexers with serial number is 101923 or 101044. some customer feedback, when config Benz SD Connect C4 multiplexers, can’t find the hardware, can’t show the IP and WLanMac.. perhaps, you update the SD Connect firmware by youself, SD Connect multiplexers is locked. 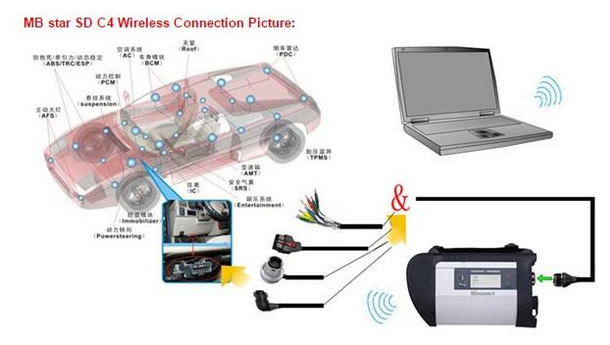 Please do not worry, Below Autonumen sharing How to solve MB SD Connect C4 multiplexers diagnose locked problem. Here autonumen share some solution and suggestion for locked SD Connect multiplexers for Mercedes Benz. 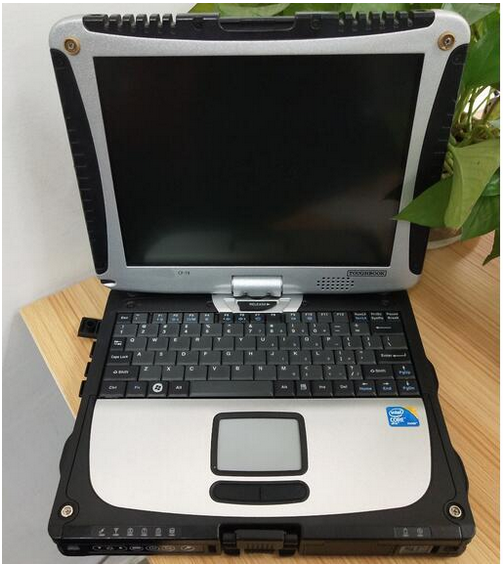 you can try press “i” and “v” together during boot you should get PM PIC firmware version or send email to:Service@autonumen.com ., autonumen will show the solution of locked SD Connect multiplexers for Mercedes Benz. NOTE: Must use the new battery and make sure battery is fully charged, otherwise may fail to update the firmware. Connect the Star diagnostic Connect multiplexer with computer via LAN cable and connect it with vehicle using OBD main cable. 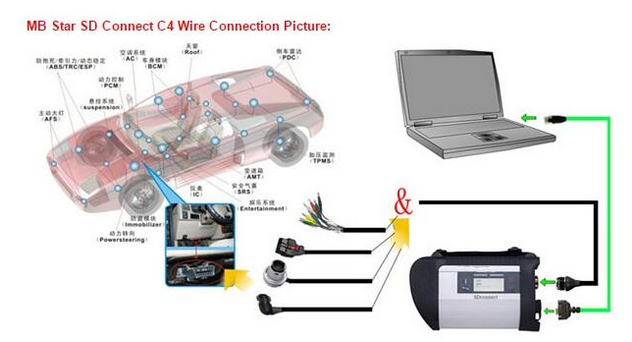 If SD C4 cannot connect to vehicle, feed it with OBD 12V power supply. If SD Connect is not connected with vehicle or fed with OBD 12V power supply, the SD Connect will report 622 firmware update fail error. If the file names are incorrect, rename the file. Q: Blue screen after insert SD C4 Dell D60 hard disk into the computer and open it. A: Make sure Dell D630 computer is integrated video card and with 1GB memory, because the D630 of discrete video card is easy to have blue screen or shutdown and restart, restart and shutdown. A: Check whether computer is compatible with SD C4 2013.05 software. If choose d630 hard disk, it needs to work with Dell D630 computer with integrated video card and 1GB memory; if choose movable hard disk, it’s requirement to the computer is: CPU 2.0GHZ or above, 2GB memory or more, Windows XP professional. A: The DAS on the desktop is only English available, after enter into Xentry you are allowed to set the language you want. Just enter into Xentry whatever car models you want to diagnose, and if the car model should be diagnosed and programmed in the DAS but you enter Xentry, it will automatically switch into DAS and the DAS language will be as the same as the Xentry language. 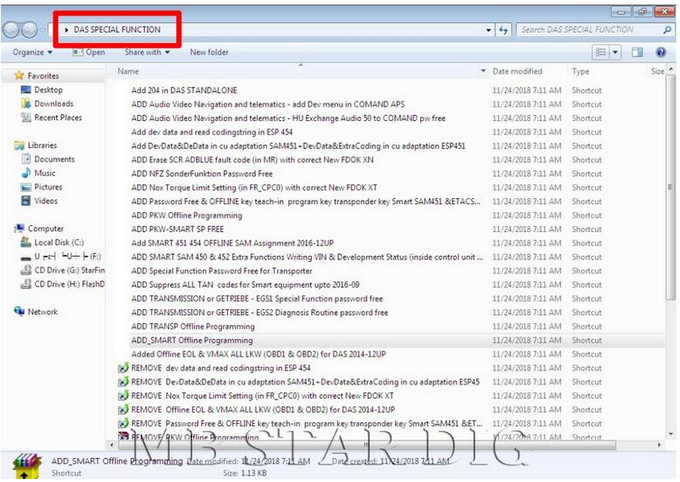 Q1: When Setup SD connect Compact 4 hard disk, while got a message reading “No access authorization code! Please contact the Star diagnosis call center. A1: It needs activation, please send us Hardware fingerprint, LAN-ID and HW-ID, then we will help you active. Many times ago, i saw a blog about MB sd connect C4 for benz, the author said he like this tool very much, and make a comparison with MB Star C3 for a result that MB Star C4 is much better than c3, I was not too much attention to it. However, a month ago, i also saw a thread on an auto fourm about obd tools, the generl mean about the thread is Mb Star C3 is better C4. i think it’s a question, so i want to serach some infos on the internet. I serach “what’s the difference between Mercedes Star Diagnostic MB Star C3 and MB Star C4″ with google, and get some answer. Here i made a discription about C3 C4 and with a share. 1.Many people on the internet all said the MB Star C3, C4 software is the same, C4 whit SD CONNECT also with this software, and for the hardware, C3,C4 is same function in diagnosing. 2.For mercedes Benz, C3 and C4 also can do work, in my opnion, C4 work with all the benz and more than C3, but C3 can do benz truck very well, this is advantage for c3. 3.MB Star C4 is much stronger in anti-interrupting ability, when C4 tests cars, it’s hard to influence by the environmenr outside, such as magnetic field，noise. C4 is much smaller in the appearance than C3. 4.Benz compact 4 SD-Connect is a latest Benz wireless multiplexer. It will connect to the PC by wireless connection. 5.The biggest difference, i think, is connection wiring mode, C3 need 232 port, but C4 can be used with network port, even wireless. 6.Also, the price C3 and C4 is very different, now C3 is the half price fo C4 as far as I know. could you some guys add more infos? i want to know more, thanks. Q:Do MB STAR C4 Fit all computer, how to use it for benz cars? i want to get more infos. A:No, mb star c4 only fits Dell D630 laptop, you’d better have a Dell D630 if you want to use a mb star c4. So many customer meet some problem when they operate MB Star C4.If you also have some problem .pls do not worry about that .you could tell us what is happened and send the picture which step could not work .Our engineer will solve that one by one for you . Q1: The Mercedes Benz Scanner Diagnostic Tool MB STAR C4 could work with the window 7? A1: Although the moveable hard disk version is compatible with WIN7, better Professional version. But we suggest you not use WIN7, 90% sdc4 software get broken because of the usage of WIN7. Q2: When you operate the mb star c4 but that the Screen become blue after insert SD C4 Dell D60 hard disk into the computer and open it. A2: Pls note : you need make sure your Dell D630 computer is integrated video card and with 1GB memory, because the D630 of discrete video card is easy to have blue screen or shutdown and restart, restart and shutdown. Q3:When you operate that .if appear the problem as following picture ? A3: Pls do not worry about that .you need activate that .and then we will send the the Xentry deverloper file then you will activate that is ok . Here i wont list more one by one here ,if you meet any problem when you operate the mb star c4 ,pls contact us on our website : www.autonumen.com .